Texting and biking requires focus (and a bit of stupidity). What could switch these biker-brains into a stressful, goggled-eye condition (rollover)? What causes your brain to switch from the quiet focus needed to read (or write) these words to the frantic, goggle-eyed arousal needed to confront a frothing dog or rabid boss? That hyper condition, popularly called the fight-or-flight response, is a hormonally inflicted surge of stress that puts all systems on alert, raises the heart rate and blood pressure, and shifts blood from the gut to the muscles. This is not when you want to be translating Latin or solving equations, but fight-or-flight certainly fulfills its evolutionary role of allowing the body and brain to survive threatening circumstances. After the transition, the brain regulates attention differently: A person studying Japanese woodcuts is unlikely to notice someone prowling on the other side of the art library. A person cranked up on stress hormones is unlikely to miss the lurker. Neuroscientists long ago fingered two “stress” hormones — cortisol and noradrenaline — as playing key roles in fight-or-flight and today, a study in Science helps confirm that noradrenaline, not cortisol, triggers the transition to a different level of attention. “Many people thought cortisol would have an effect on the attention process in the early phase, but our study shows cortisol probably is not as important” as noradrenaline, says first author Erno Hermans, of the Donders Institute for Brain, Cognition and Behaviour at Radboud University Nijmegen Medical Center in Holland. 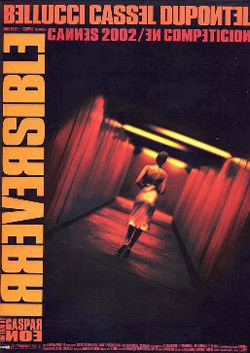 According to some film critics, Irréversible was one of the most disturbing films of 2002. No wonder it stressed-out the study subjects! 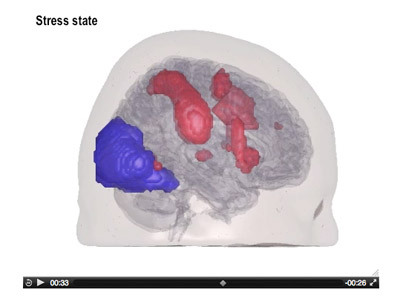 To study the mental effects of stress, Hermans and colleagues put 80 subjects in a magnetic resonance imager and tracked the usage of oxygen in the brain to show which structures were active at any moment. Then the subjects watched parts of a French movie containing what Hermans calls “particularly horrific” scenes of violence. To confirm that the violent movie clip was triggering the stress response, the researchers measured heart rate and chemicals in the saliva. Long-term stress can lead to many problems, including the disabling post-traumatic stress disorder, and cortisol, which makes memories more vivid and plays a major role in the constant arousal and intrusive memories of PTSD, has long been considered a major player in stress in general. In a second phase of the experiment, Hermans and his colleagues used drugs to block either cortisol or noradrenaline. Blocking cortisol did not prevent the changes in brain networks, but blocking noradrenaline did. “Because blocking noradrenaline results in a reduction in the salience network, this shows that noradrenaline is important for this reorganization of the brain,” Hermans says. This animation shows which areas of the brain are switched on by a stressful situation.